Upon stepping into Two Hana, we were drawn in by its pastel interiors. 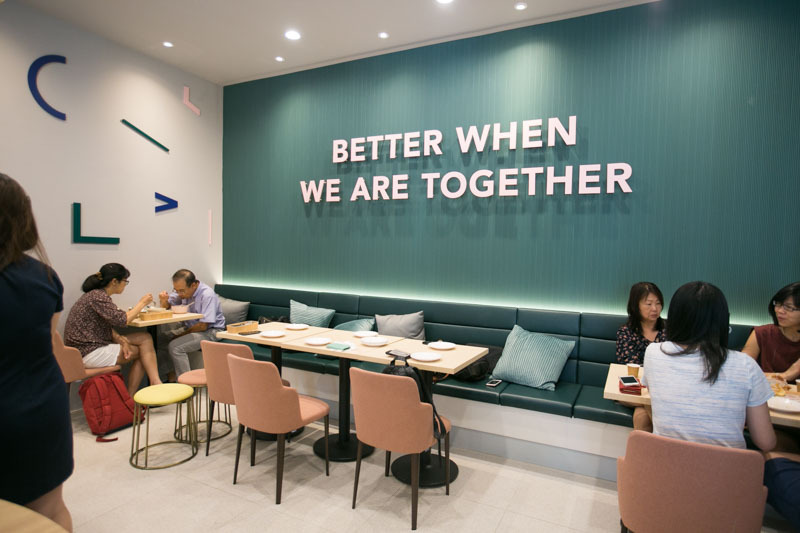 This Insta-worthy store in the newly-revamped Century Square is the latest addition to Seoul Garden Group. Hana (하나) means “one” in Korean and the idea of the cafe is to bring two individual cultures and flavours together, hence its name. We started off our meal with this appetiser, Korean cauliflower fritters ($9), which we initially thought were Korean spicy drumlets. We were blown away at our first bite, and it certainly was a pleasant surprise. The cauliflower, well-coated with a dakkangjung (sweet and crispy chicken) sauce, had a nice bite to it. We synonymously agreed that even those picky with their greens will find this palatable! Mac and cheese lovers, you’ll definitely have to order this Kimchi mac and cheese ($9 / 5 pieces). Though, after the first dish, I felt that this one was pretty mediocre. Texture-wise, I liked how the exterior remained crispy even after sitting on the table for awhile. However, the taste of the kimchi mac and cheese didn’t particularly stand out to me. Perhaps it could have been better if the mac and cheese were slightly more flavourful. Next up, we had the Korean Seafood Ciopinno ($12). For those unfamiliar with this dish, the Ciopinno is an Italian-American style fish stew. Though its texture is not as thick as what we would have expected, it tasted very much like a rich prawn bisque. The touch of tomato puree and cream elevated the umami taste of the soup and we savoured it to the very last drop. Served with a choice of tofu or handmade bread rolls, this soup would make a hearty and delightful meal. The most expensive item on the menu, the Braised Gochujang Lamb Shank ($24), is sous vide for 36 hours. However, it did not turn out as tender as we would have expected it to be. That aside, the gochujang (fermented red chilli paste) went well with the kimchi mash and fresh bread rolls that are made in-house. The generous portion makes this dish perfect for sharing. We were impressed with this unassuming bowl of beef bibimbap. The Striploin Bap ($13) tasted quite different from those we have had and turned out to be our favourite dish of the lot. Remember the fragrant Kimgaru (shredded seaweed) rice from Seoul Garden? Top that with kimchi, spinach and bean sprout, caramelised onions and a runny 63-degree poached egg. And the final touch? A generous portion of perfectly-seared medium rare striploin slices; it was an unbeatable combination. Moving on to the desserts, we had the Apple Caramel Waffles with Doenjang Caramel Ice Cream ($9). Doenjang is a fermented soybean paste which is normally used for cooking savoury items. Think salted caramel, Korean version — this is what you’ll get. Served with stewed apples, fresh green apples and seaweed fish skin crisp, it was certainly a very unique mix. It felt like an interlude, slowly leading us from the mains to desserts. For the less adventurous — those who prefer drawing a clear line between savoury and sweet foods, go for the Strawberry Waffles with Honey Citron Ice Cream ($9). Like the previous dish, the name was a little misleading. Given the name “Strawberry waffles”, we were expecting the waffles to contain bits of strawberry or at least somewhat taste like the fruit. Instead, it was just plain waffles… topped with a few slices of strawberries, blueberries, pink fairy floss and honey citron ice cream. Other than its appealing aesthetics, there was nothing that spectacular about this dessert. Their Iced Matcha Latte ($6) and Iced Hojicha Latte ($6) were the perfect pick-me-ups for a hot day. The crisp plain Bungeo-ppang (fish shaped pastry) served alongside the thick and creamy tea lattes were simply irresistible, and filling enough for an afternoon snack. If you’re having a heavier meal, a more suitable choice of beverage would be their Melona calpis float ($7). The refreshing mixture of Calpis puree and sprite is topped with a melona popsicle. It is recommended that you stir well before taking a sip. Finally, the Cookies and Cream Affogato ($7) marked a delightful end to our meal. The bitterness of the espresso shot was balanced by the sweetness of the cookies and cream ice cream. To top it off, finely-chopped almonds and toasted buckwheat were sprinkled over the ice cream to give it an added crunch. For those who are always in search of a nice and chill workspace, you’d be thrilled to know that WiFi is available here. As long as the cafe is not packed with patrons during peak hours, you are more than welcome to make yourself cosy in one of their booths or communal tables. Overall, we enjoyed our time at Two Hana, and see ourselves returning in the near future to try out the rest of the food on their menu (and their delectable selection of cakes). Psst, one more thing — everything on the menu is nett-priced!